Seventeen-year-old Molly Montgomery never planned on becoming famous. Molly's band, The Hormones, was just supposed to be about mucking around with her best mates, Jane and Tara; writing songs about Hello Kitty; and being a girl. But when the group is joined by the deliciously dangerous Dean and his friend T, things onstage-and backstage-start happening, fast. Soon The Hormones are front-page news, and their debut album is rocketing up the charts. Molly is the force behind the band, but the hazards of fame, first love, screaming fans, and sleazy managers are forcing the newly crowned queen of grrl angst close to the edge. Fame never comes for free, and Molly's about to find out what it costs. This book was very funny and I've been wanting to read it for absolutely ages! I read it in a day (only just, it kept me up until midnight to finish it!). The characters were funny, the story kept you interested, the cover was funky... it was fantastic! 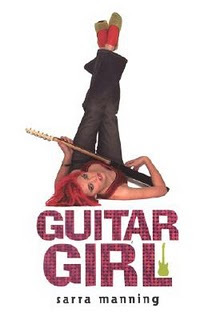 My only complaint is that in the book it says she has a pink guitar but on the cover she has a black one... that was the only complaint! My favorite character was Molly because I loved her hair (it was pink!) and I loved her sense of humour. I love any character with a good sense of humour! I could not put this book down, honestly! It was like there was invisible super-glue on my hands, I just had to keep reading! The prologue pulled you into the story and I couldn't put it down until I got to the end of the book. And even then I wanted more! I give this book 5/5, I think it's one of Sarra Manning's best books.